I fell in love with Hongdae the moment I stepped on the platform of Hongik University Station. The place was bustling with energy, and you'll get a feel of this as soon as you join the throng of people making their way out of exit 9. You'll literally rub elbows with strangers as you ascend the stairs to get to the main street. 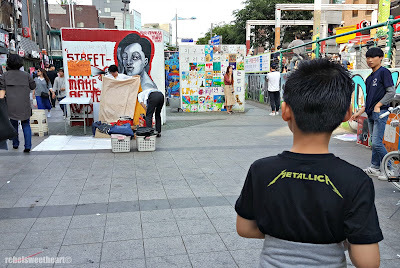 Take note that we visited on a Saturday, Hongdae's busiest, liveliest, most crowded day of the week. Once you escape the nightmare that is exit 9, you will be greeted by a warm and youthful, oftentimes artistic vibe. Hongdae, after all, is the home ground of Hongik University - one of the best art institutions in South Korea. 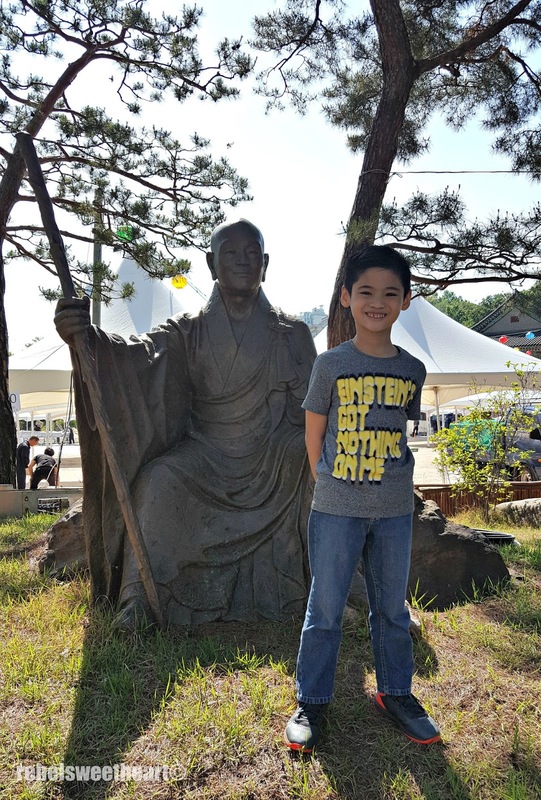 Little man ready to explore Hongdae! 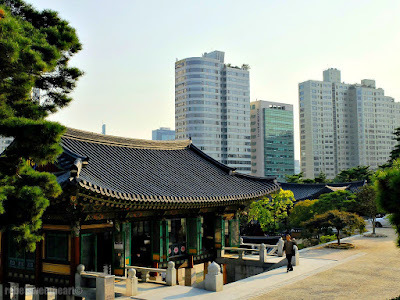 More of our trip to Hongdae after the jump! 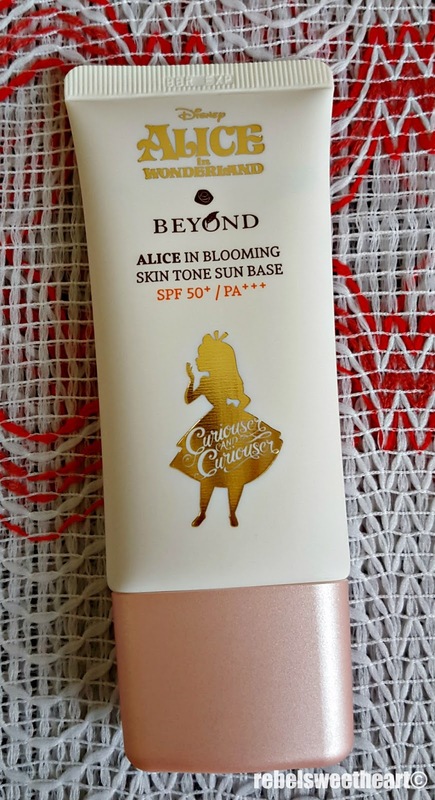 Spotlight | Beyond Alice in Blooming Skin Tone Sun Base. When you live in a tropical country such as the Philippines, it feels like summer all year round. Today's weather, for instance, was unbelievably hot and humid (31 degrees, but it felt more like a scorching 39 outside) - to think it's already the rainy season. 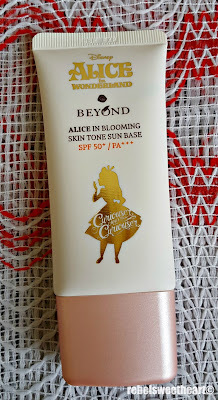 Beyond Alice in Blooming Skin Tone Sun Base. 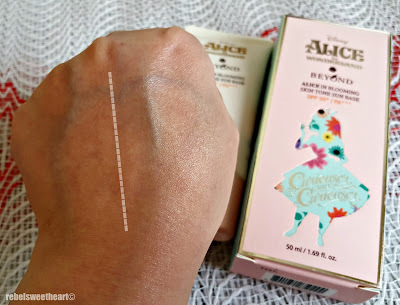 And this is exactly the reason why I bought this Alice in Blooming Skin Tone Sun Base when I visited Korea last spring. This sun base, which sells for 17000 won (around Php 700 or $14), is part of Beyond Cosmetics' and Disney's Alice in Wonderland collaboration collection. Lovely illustration on the side panel. Now I'm all for primers with SPF for three good reasons. Primers, for one, keep your makeup intact and last for an entire day at the most. With the added sun protection factor, you don't have to apply another sunblock to your face. And since I can skip wearing sunblock, I don't have to worry about break-outs or allergies (hello, sensitive skin) or that heavy, greasy feel on my face all throughout the day. And pretty prints on the other side. 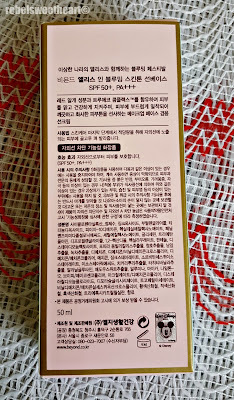 Aside from the sun protection factor - a whopping SPF 50 PA+++ - the packaging is another reason why I purchased this product. Just look at the pretty details! Even the tube itself is pretty, with its frosted pink cap and gold details that give this sun base a very elegant vibe. It comes with a screw cap for easy use, and a small nozzle which allows sufficient control on the amount of product being dispensed. However, both the box and the tube hardly have English text written on it. 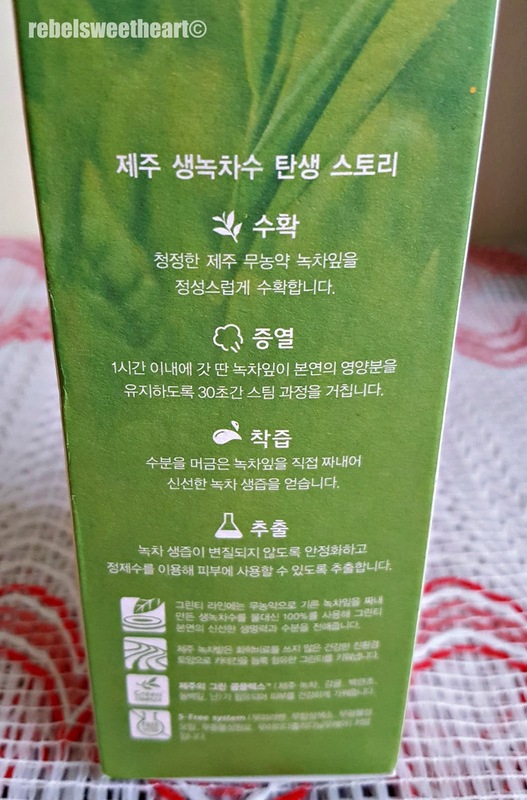 Save for the name of the product, everything else is written in Hangul. Now let's take a look at the product itself. 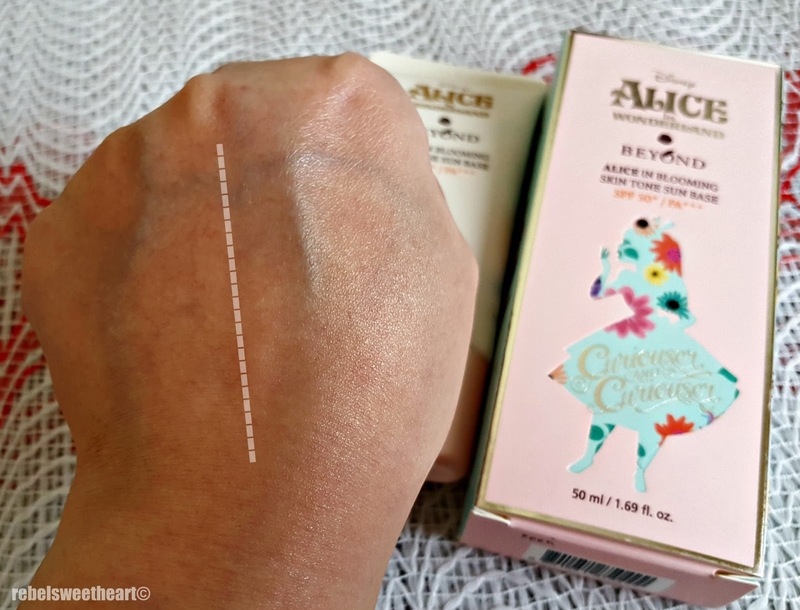 The Alice in Blooming Skin Tone Sun Base is a lightly-tinted primer that evens out the skin tone as it moisturizes and preps your skin for makeup. It also functions as a sunblock to protect the skin from harmful UV rays. ... and how it looks like when applied. This sun base contains red algae extracts known for its antioxidant properties and its ability to neutralize free radicals that can cause damage to the skin in the form of fine lines and wrinkles. 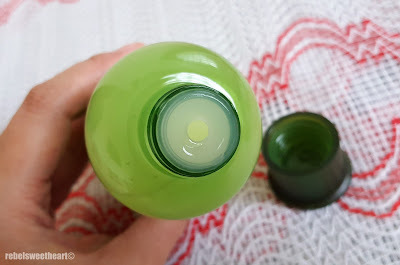 It also contains True Eco Complex, which hydrates and brightens the skin. Left without sun base, right with sun base. This product has a slightly thicker consistency, similar to that of regular sunblock but without the sticky, greasy feel. I love its lightweight, easy-to-blend formula and its subtle floral scent. 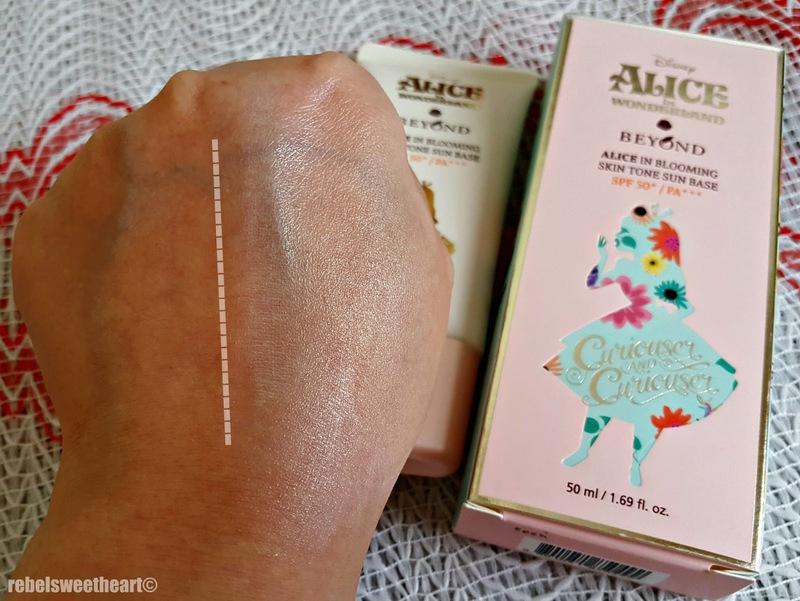 Once applied, it makes the skin look a bit shiny which eventually turns into a nice, glowing finish as it blends into the skin. 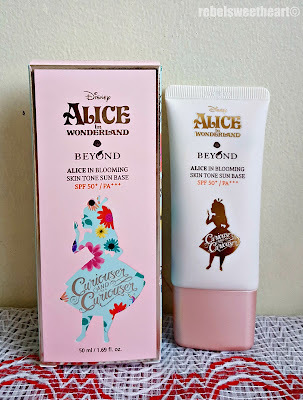 With the Alice in Blooming Skin Tone Sun Base. 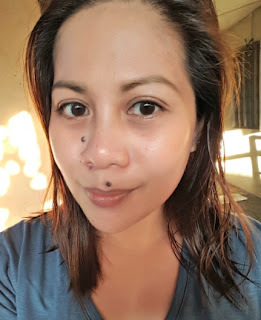 I love how this sun base preps my skin for makeup application. You know those soft focus filters work on photo editing apps? This product sort of does the same thing, only in real life. And with sun protection, at that! I certainly did not see this makeup collaboration coming! 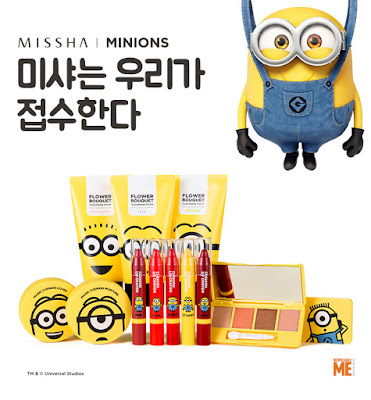 While I knew it was within the realm of possibility for 'Minions makeup' (something like flavored lip balms for kids or tweens, if you get my drift) to exist somewhere in this planet - with these cute yellow creatures' popularity and all - it never crossed my mind that a Korean beauty brand would actually release an entire line of it. And Missha, at that! I haven't even opened the stuff that I bought from the Missha x Line Friends collection, and now this! Anyone trying to resist the urge of busting their budget on new makeup will have a hard time doing so. 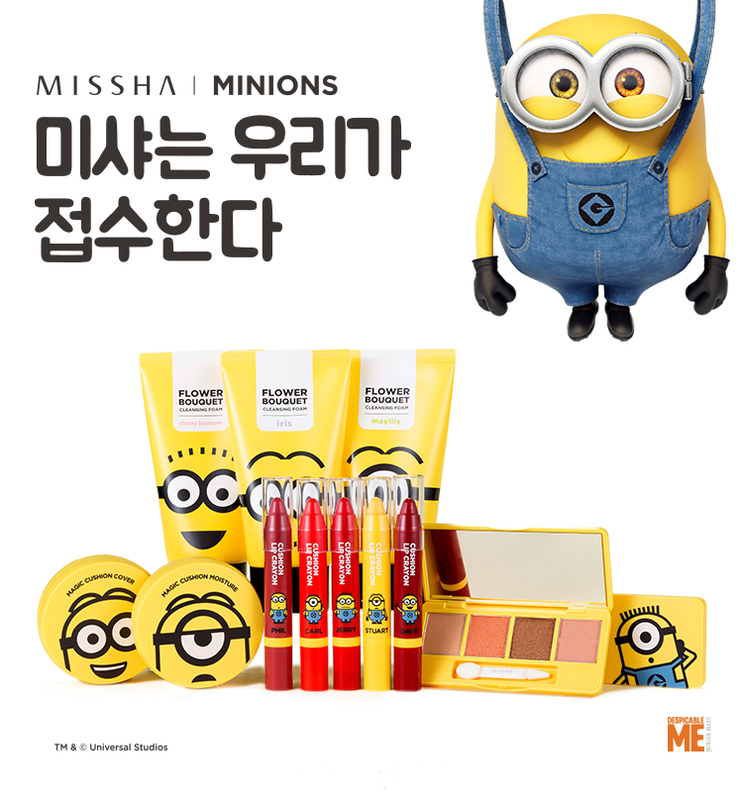 I mean, how can you say no to these adorable yellow munchkins jazzing up your runoff-the-mill makeup routine? Let the Minions mesmerize you! 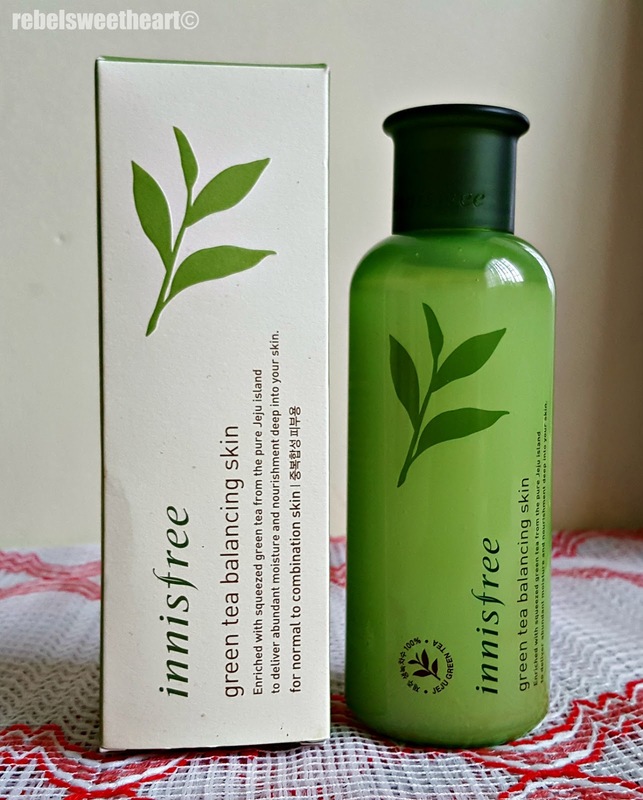 I have a growing fondness for green tea-infused skincare products, which stemmed mainly from my continued use of Innisfree's Green Tea Mineral Mist. 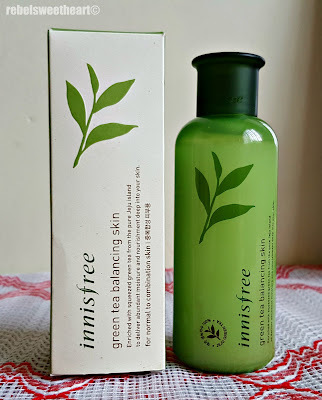 I love this product so much that I decided to try the other products from Innisfree's Green Tea line and incorporate them into my daily skincare routine, starting with the Green Tea Balancing Skin. 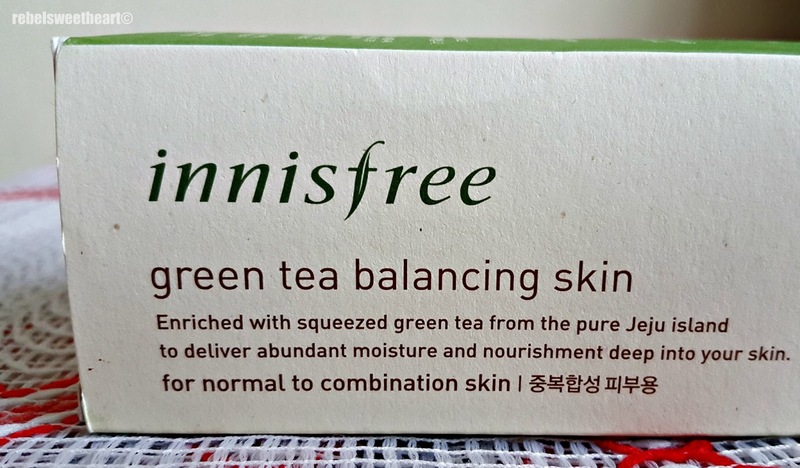 Innisfree Green Tea Balancing Skin. 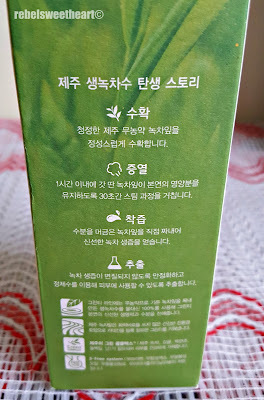 It's actually a toner, made with green tea and green tea seeds from Jeju Island. It's rich in minerals and amino acids that give nourishment to the skin and keep it moisturized. It also contains betaine, a natural moisturizing agent derived from amino acids, which provides intense moisture for combination skin to restore its natural balance. Balancing = for normal to combination skin. 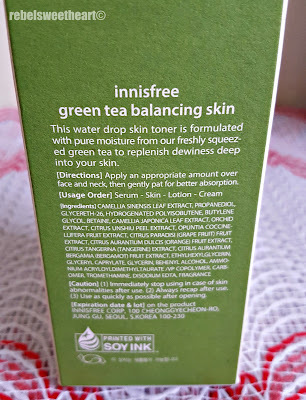 And much like any other Innisfree product, this toner is made with organic ingredients, and free from these five harmful ingredients - parabens, mineral oil, synthetic colorants, animal material, and imidazolidinyl urea, an antimicrobial preservative that acts as a formaldehyde releaser. 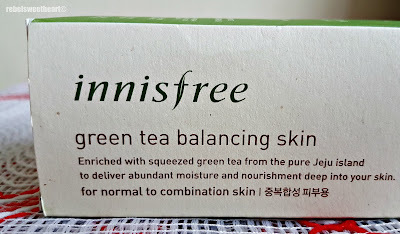 It's also packed in an eco-friendly box, another trademark packaging of Innisfree. Hangul text on the side panels. 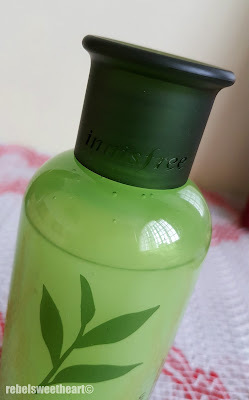 As for the toner itself, it comes in a 200 mL twist-top bottle. Nothing fancy with its packaging, but I do find the debossed text on the bottle cap quite pretty. 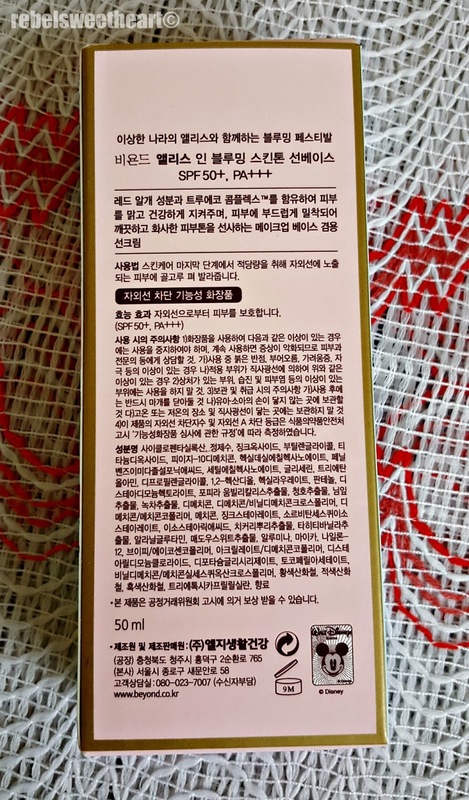 This toner, however, has a pretty unusual texture. It has a bit of viscosity to it, but it's neither sticky like gel-type toners, nor is it watery like most liquid toners. To apply, simply pour an adequate amount on your palm (two to three drops will suffice), and pat it on your face. No need for cotton pads! Has a fairly wide opening on the bottle. 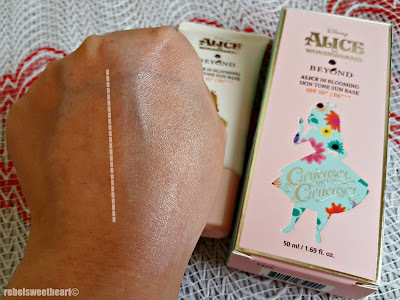 I love how this toner has this sort-of cooling effect on the skin. It's easily absorbed, and does not leave any sticky residues behind. It smells wonderful, too! Its scent is a mixture of green tea and zesty citrus notes, the kind that perks you up on lazy Monday mornings. 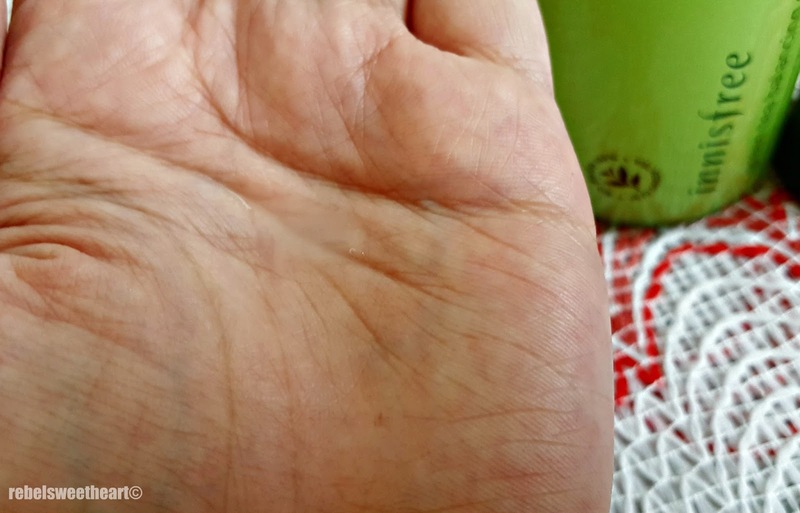 Can you see the toner on the palm of my hand? In terms of effectiveness, this toner does a good job of moisturizing my skin and keeping those pores and blackheads at bay. 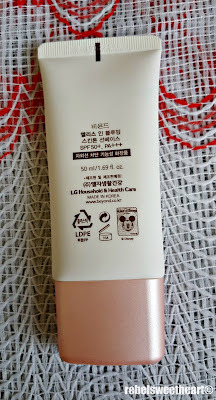 I started using this product two months ago while I was still in Korea, and my husband would compliment me every so often that I need not put on makeup since my bare skin looks healthy and glowing. I guess it's the antioxidants working wonders for my skin? Three different lines for different skin types. 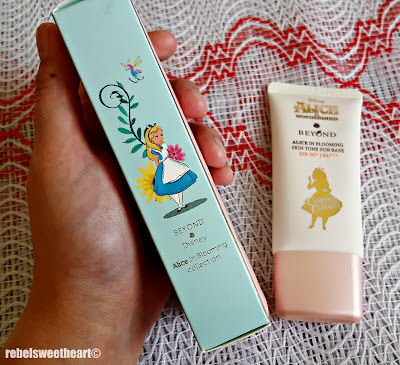 Just when I thought I have enough Disney-themed makeup in my stash, here comes The Face Shop with an all-new collaboration collection that makes me want to teleport to Myeongdong right this instant and set my wallet on fire! The Face Shop x Disney. 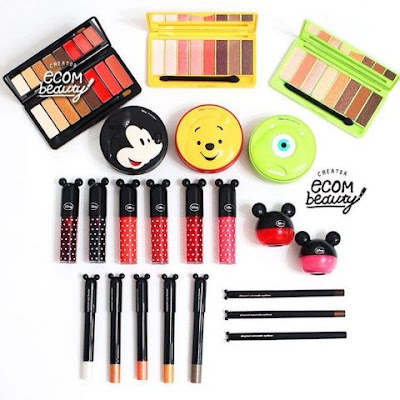 This limited edition collection effectively combines The Face Shop's most popular makeup items with our love for cute Disney characters. Resisting the urge to not buy anything from this collection is next to impossible. I know that for a fact, because right now I'm hell-bent on getting my hands on Mike Wazowski. Haha! 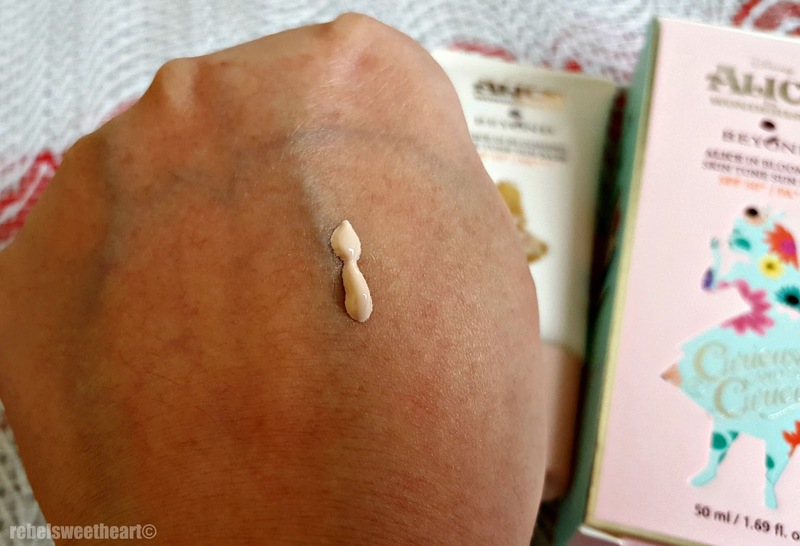 Sneak Peek | Etude House x Wedding Peach Angel Sparkle Collection. 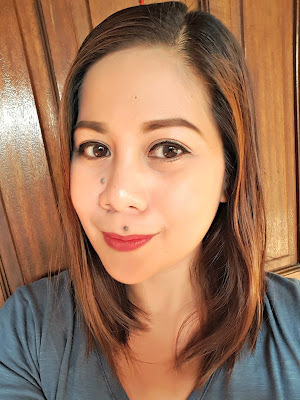 July seems to be a very promising month for makeup junkies like me as we look forward to the new product releases from some of our favorite Korean beauty brands. I'm filled to the brim with excitement as I give you a glimpse of these wonderful goodies coming our way! First up is the Angel Sparkle Collection, which I'm sure will be a big hit among anime/manga fans. 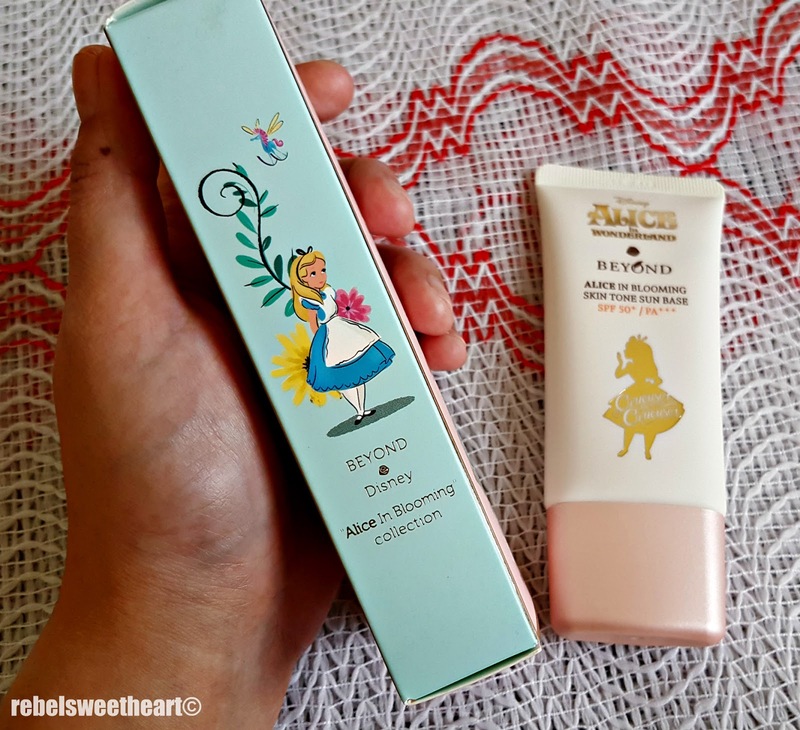 It's a collaboration collection between Etude House and Wedding Peach, a shojo manga adapted into anime television series which was quite popular in the late '90s. Lily, Peach, and Daisy of Wedding Peach! 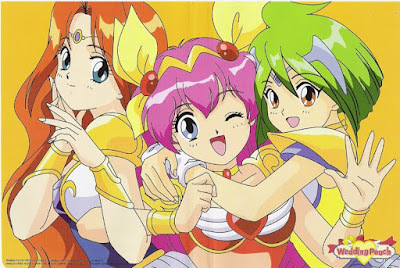 Before I got into this whole Korean drama craze, I was a huge anime fan, influenced mostly by my best friend who was an even bigger otaku than I am. We actually learned Nihongo just by watching anime, the same way I learned Hangul just by watching Kdramas. Oh, and one evident proof of my anime addiction? My son's nickname (Yue) came from one of the characters in Card Captor Sakura. 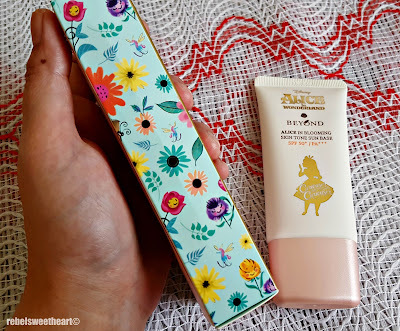 That being said, these new releases from Etude House will definitely take a toll on my wallet. I'm already a sucker for (makeup) collaborations, so what more if the products are as kawaii as these? 1. Don't Sweep Minor Conditions Under The Rug. One of the reasons that many people fail to optimize their health results from their unwillingness to take minor conditions seriously. Don't make this mistake. Even something like periodic feelings of chronic fatigue can be indicative of a more serious issue. With this idea in mind, make sure that your conditions are accurately diagnosed so that you can eliminate them quickly and correctly. If you think you may be experiencing a serious condition, you can obtain testing kits from organizations like Diagnostic Automation. This company offers a wide range of testing kits, including the rapidtest. Although stress is an inevitable component of life, it must be managed. If you experience unmediated stress on a regular basis, you can make yourself susceptible to numerous diseases and mental illness. Luckily, there are multiple methodologies you can deploy to decrease the power and prevalence of stress in your life. One of them is daily meditation. 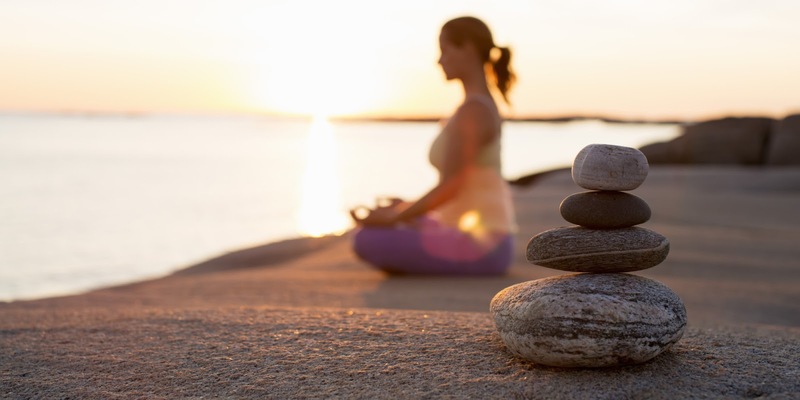 Investing in a monthly massage is another wonderful way to decrease your stress levels. If you really want to lead a healthier life, make a point to develop goals. Doing so will help you get specific about what health outcome you're trying to attain and which steps you will take to realize your objective. When you begin writing your goals down, make sure that they are SMART: Specific, Measurable, Attainable, Realistic, and Time-Specific. An example of a great health-related SMART goal would be "I will jog on the treadmill for one hour four times a week to lose one pound a week." If you've decided that you're no longer satisfied with your life due to a chronic condition that detracts from your mood and energy levels, now is the time to deal with the issue. By implementing some or all of the health techniques listed here, you'll likely find that your level of mental and physical well-being begins to skyrocket! Experts estimate that more than 80% of women go through the day wearing the wrong size bra. Those who spend any amount of time in the public arena will easily see that these statistics are correct. 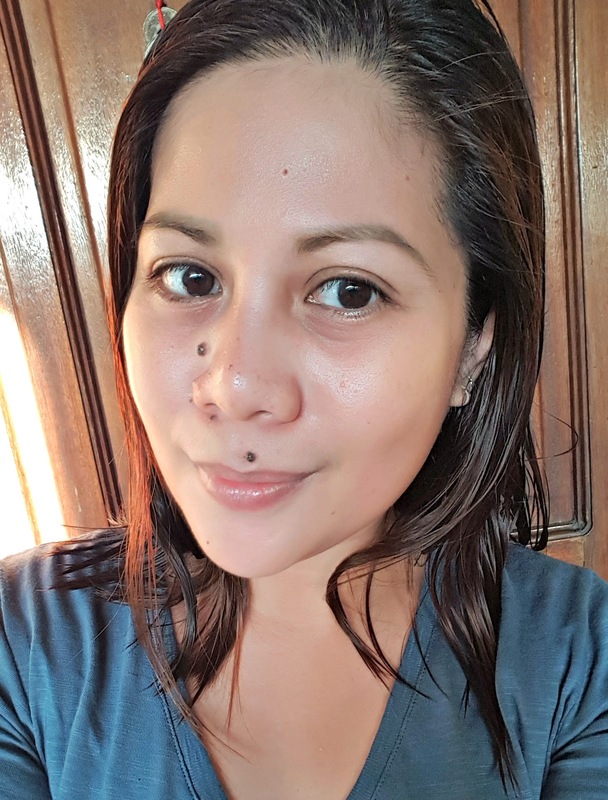 Women can be seen everywhere with bra problems: bra straps that ride up the back, cleavage in all the wrong places, breasts that sag too low, are smashed too close or are squeezed out of the sides or top of their bras. If you are one of these 80% of women, a proper-fitting bra doesn't have to cost you an arm and a leg (or a breast!). Use the following tips to help you find flattering lingerie at a price you can afford. Many women cite budgetary considerations when asked why they are walking around in ill-fitting lingerie. A good bra can be an investment, especially if you wear a specialty size or a size that isn't sold at mass retailers and "big box stores." However, you don't have to purchase your lingerie from an expensive, upscale lingerie boutique in your town. Consider purchasing bras and other foundation garments from online retailers like Mamia Underwear at wholesale prices. Many women are timid when it comes to discussing lingerie or having a professional fitting done. However, you can't find the right bra if you don't know what size you need. Again, skip mass retailers and lingerie chains - most of their employees don't know much more about measuring bra sizes than the general public. Find a local lingerie boutique with professionals that can measure you properly. Most of these stores will fit you for a bra even if you don't make a purchase. If you don't have a lingerie boutique nearby, you can measure yourself, just make sure you find a good tutorial and do it properly. And keep in mind that while there are "sister sizes" in bras, it's best to wear your actual size, as a "sister size" won't fit nearly as well. Keep in mind also that while there are many styles of bras, not every style of bra will work for every body. Demis, pushups, balconettes, plunge, bandeau, contour and even sports bras are options. Choose the right bra for your breast type and your lifestyle needs.